is vice president of operations for the U.S. Gulf Coast at The Dow Chemical Company, where he is responsible for nine manufacturing sites, including Dow's Texas operations, the company's largest integrated chemical manufacturing complex. He joined Dow in 1981 in Freeport, Texas, and has held a number of leadership positions throughout the United States and globally, including president of India, Middle East and Africa operations; business group president for basic chemicals; and global vice president for the oxides and glycols business. Mr. Shipp is the Dow Chemical Executive Sponsor for the Society of Women Engineers and the National Society of Black Engineers. 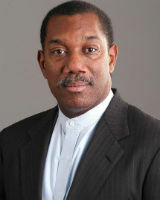 Mr. Shipp has played an active leadership role in numerous civic and professional organizations all over the world. He is the former chairman of the board of the New Orleans Branch of the Federal Reserve Bank of Atlanta and is currently a member of the Federal Reserve Energy Advisory Committee. He has served as the deputy chairman of the board of EQUATE Petrochemical Company and vice chairman of the board of M.E. Global BV. Mr. Shipp is currently chairman of the executive committee of the Economic Alliance of Brazoria County, Texas. He is also a member of the Greater Houston Partnership Board of Directors, the executive committee of the board of the Texas Taxpayers and Research Association, and the Texas Chemical Council Board of Directors. He is a graduate of Cass Technical High School, earned a chemical engineering degree from Wayne State University and an M.B.A. from Indiana University's Kelley School of Business.